Keeping it simple also helps keep you sane. My father used to say, “A lazy engineer is a good engineer. They will find the easiest and most efficient way to get things done.” I took that to heart when I became an engineer and made sure I kept anything I designed simple to learn, and simple to use. “The overall methodology: clear, organized, simple to implement. I was amazed that course went far beyond project management. There were some beneficial life lessons embedded in the course as well. 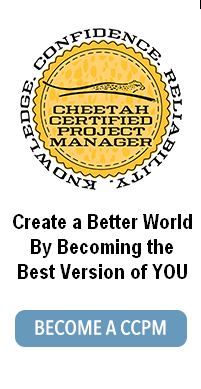 I would recommend the course to anyone who needs a fresh approach to life in general.” – L. G.
For today’s Share the Love post, Keep it Simple – learn Cheetah Project Management in this 20 hour online course and earn 20 PDU’s in the process – for $400. Use the promotion code – keepitsimple at the registration.